You may or may not have heard by now that next year ITIL® is being updated, and ITIL 4 will come to life. But what does that mean for you? Well fear not, in this blog post we’ve broken down exactly what is happening with the ITIL qualifications and how this will affect both those who are, and are not, currently ITIL-certified. As our new technological era continues to develop and change at an ever-increasing rate, ITIL is also changing to help businesses navigate this effectively. ITIL 4 provides a smooth transition from organisations’ current ways of working to a faster, more flexible and adaptive approach. The modern technological age is marked by new and emerging technology, in fields including robotics, artificial intelligence and nanotechnology, and ITIL 4 offers a more practical and flexible basis to support organisations as they venture through these developments. As such, it has a greater emphasis on the business and technology world, how it works today and how it will work in the future with agile and DevOps methods, and will therefore be much more relevant to developers than previous versions of ITIL. Version 4 will also place a much greater emphasis on the importance of collaboration, transparency, automating (where possible) and working holistically when delivering products and services. This new iteration of ITIL has been developed to be compatible with the existing certification scheme. It incorporates all the best parts from ITIL as it is known today, and expands on these to a new level – supporting faster, quality and value-driven delivery for everyone. How does this affect ITIL version 3? ITIL v3 is still as relevant as ever – it is still in high demand across the globe and continues to be recognised as a valuable IT certification to have. As ITIL 4 is an expansion of the content in v3, all previous certifications for ITIL are still relevant and will remain valid following the update, however beyond June 2020, the v3 Foundation exam will no longer be available. If you are already qualified in ITIL v3 Foundation, it is recommended that you take the new ITIL 4 Foundation course, and its accompanying exam, in order to transition to the new scheme. There will be no bridging Foundation exam from version 3 to ITIL4. Take the ITIL 4 Foundation course and then one further module in your preferred area of interest, becoming either an ITIL Specialist, Strategist or Leader. Achieve 17 credits from ITIL v3 to become eligible to take the new ITIL Managing Professional transition module. This enables candidates to fast-track past the current Managing Across the Lifecycle (MALC) course and exam. If you have already gained at least six credits, then it would make the most sense to continue collecting v3 credits until you can take the Managing Professional transition module and fast-track past MALC. 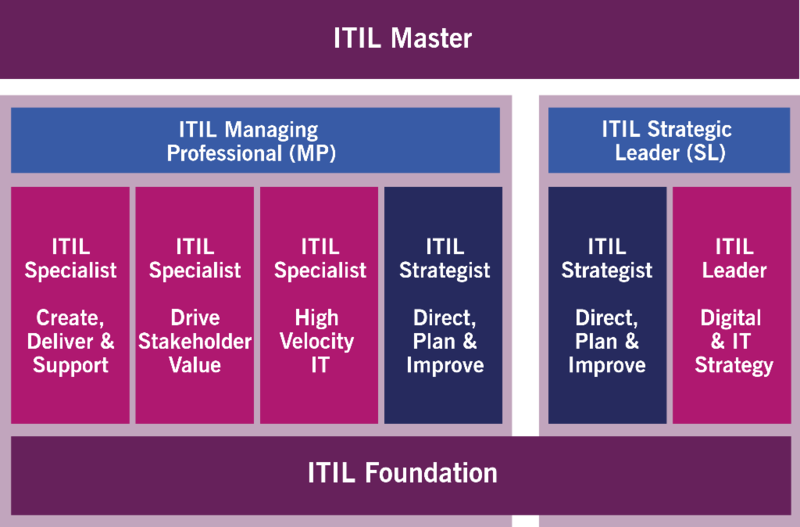 If you are a qualified ITIL Expert, then you simply need to take the Managing Professional transition module to get up to date with the new ITIL 4 material. For more information on the ITIL courses on offer at ILX, click here.